After the high drama and explosive action of last issue, you pretty much get what you might expect this time – a slowing down, more dialogue, and a proper introduction to the ‘safe zone’. 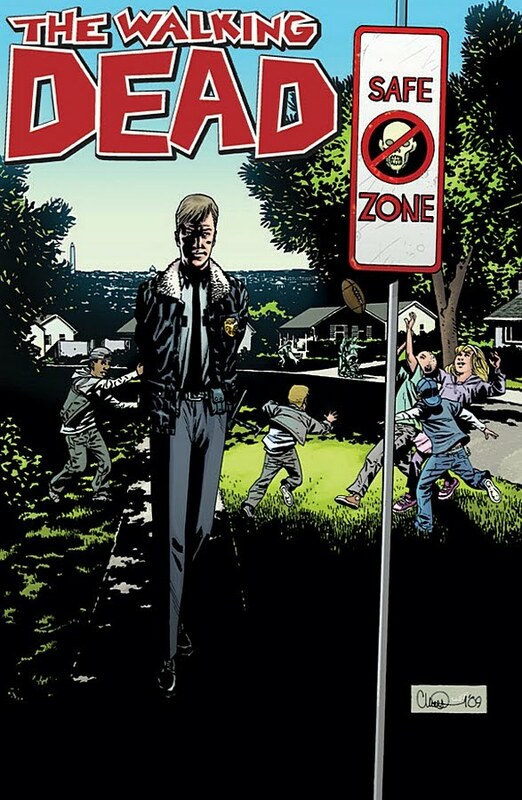 As you may also expect, Kirkman and Adlard almost immediately begin to convey a sense of uneasiness about this new community – but whether that is merely the creative team showing the unease of Rick and his companions in these new surroundings, is unclear. That uneasiness, that tension increases when we are introduced to the nominal ‘leader’ of the community, Douglas Monroe. His conversation with Rick is fairly straightforward until he/Kirkman plunges the reader into a bizarre and stomach churning account of a Fathers inhumanity to his Son. What makes it particularly poignant – and more distressing – is that it is based on fact. Monroe’s purpose in mentioning this crime seems pretty unfocused, other than the fact he is illustrating that we,as a race, have an inordinate capacity for cruelty and failing our loved ones. Maybe it is portentous. It was unsettling. There is more to suggest that this community is recovering from some terrible event, and again we as readers are reminded that this ‘safe haven’ is barely concealing scars. The name of ‘Davidson’, mentioned last issue, crops up again. Whatever it was that he initiated, it sounds terrible. We will no doubt be better informed on him in time. As well as the unease, there is a sense of out protaganists finally accepting they have reached some sort of safety, and actually enjoying the ‘little things we take for granted’ moments, like a hot shower, or kids playing out in the open, care-free. Nice moments. A solid, entertaining opener to this new era. A mix of hope and crushing, frightening reality – ‘the lights are on but the shadows seem to be encroaching’ type of vibe. I get the feeling this will not end well.